Tahoe Production House is proud to share the launch of www.biketahoe.org The only comprehensive online bike guide for the Lake Tahoe region that includes 65 individual bike rides with GPS enabled maps, detailed ride information and interesting historical information related the the ride information. The 65 rides cover Mountain, Road and Cruiser bike rides and within each category a user can select beginner, intermediate and advanced challenge levels. The ride guides cover five regions: South Tahoe, North Tahoe, Truckee, Carson Valley, and the California Alps. We spent nine months in development with Bike Tahoe’s founder Ty Polastri of Team Tahoe. The foundation of the website is maps of each ride that were ridden by Ty with the route captured using a Garmin GPS device. The maps were then exported as GPX files out of the Garmin program then uploaded into our selected WordPress mapping plugin. Bike Tahoe will be launching a location based mobile app in 2016 to take the website concept to the next level enabling bicyclists to truly track their movements on any given ride and share their ride info across social media. 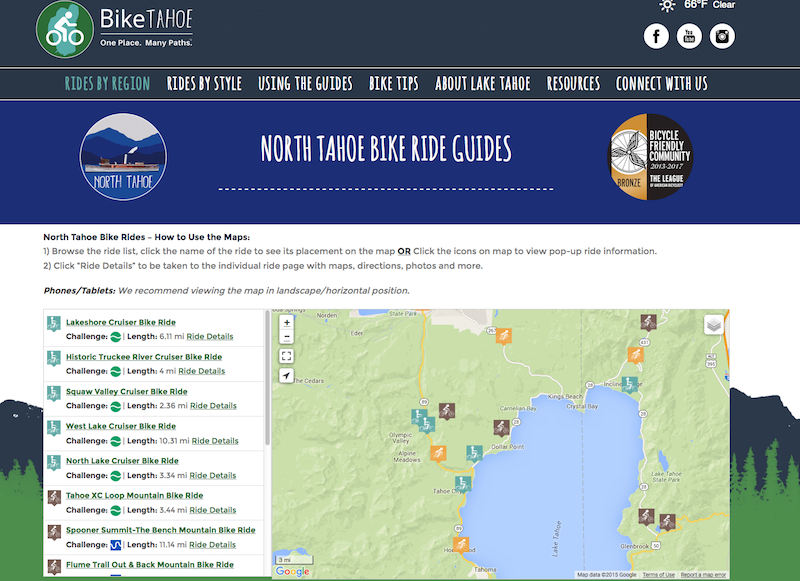 www.biketahoe.org is jointly funded by the Nevada Commission on Tourism, El Dorado County Cultural and Community Development, and the City of South Lake Tahoe.